The HAL Tutorial has a number of examples of halcmd usage, and is a good tutorial for halcmd. Halmeter is a voltmeter for the HAL. It lets you look at a pin, signal, or parameter, and displays the current value of that item. It is pretty simple to use. Start it by typing halmeter in an X windows shell. 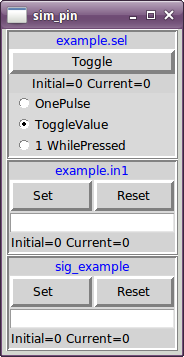 Halmeter is a GUI application. It will pop up a small window, with two buttons labeled Select and Exit. Exit is easy - it shuts down the program. Select pops up a larger window, with three tabs. One tab lists all the pins currently defined in the HAL. 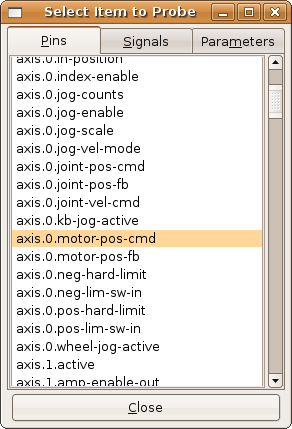 The next lists all the signals, and the last tab lists all the parameters. Click on a tab, then click on a pin/signal/parameter. Then click on OK. The lists will disappear, and the small window will display the name and value of the selected item. The display is updated approximately 10 times per second. If you click Accept instead of OK, the small window will display the name and value of the selected item, but the large window will remain on the screen. This is convenient if you want to look at a number of different items quickly. You can have many halmeters running at the same time, if you want to monitor several items. If you want to launch a halmeter without tying up a shell window, type halmeter & to run it in the background. You can also make halmeter start displaying a specific item immediately, by adding pin|sig|par[am] <name> to the command line. 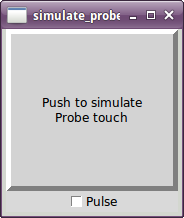 It will display the pin, signal, or parameter <name> as soon as it starts. (If there is no such item, it will simply start normally.) And finally, if you specify an item to display, you can add -s before the pin|sig|param to tell halmeter to use a small window. The item name will be displayed in the title bar instead of under the value, and there will be no buttons. Useful when you want a lot of meters in a small amount of screen space. Refer to Halmeter Tutorial section for more information. See the man page for more options. See section Halmeter. Halscope is an oscilloscope for the HAL. It lets you capture the value of pins, signals, and parameters as a function of time. Complete operating instructions should be located here eventually. For now, refer to section [sec:tutorial-halscope] in the tutorial chapter, which explains the basics. The halscope File menu selector provides buttons to save a configuration or open a previously saved configuration. When halscope is terminated, the last configuration is saved in a file named autosave.halscope. 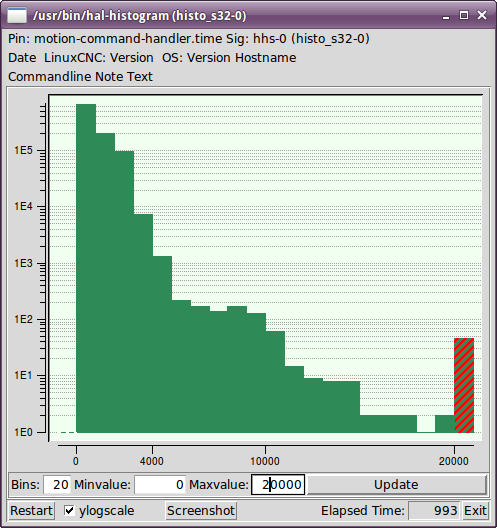 hal-histogram is a command line utility to display histograms for hal pins.